Hello to all! This week we will be building on site! We will have a regular half day build day this Friday. Saturday marks the beginning of Women Build and our temporarily altered schedule (please see the events and happenings for this Saturday in the section below). 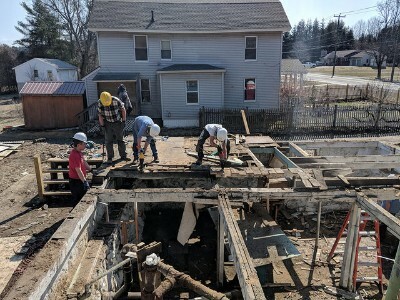 If you are curious about volunteering during Women Build and you have not already made contact with a Habitat staff member, please be in touch with Katiana Selens (413-442-3181 kselens@berkshirehabitat.org). How: Please contact our Volunteer Coordinator Katiana Selens (kselens@berkshirehabitat.org 413-442-3181) if you would like to volunteer this Friday. This will allow us to have a proper head count and a suitable number of tasks prepared for the day. Thank you in advance! Last Friday our volunteer crew cleaned the job site, grouted concrete block, fixed the basement floor and prepped the former "Pep Boys" store for Women Build Kick-off 2018. On Saturday morning the crew worked with 5.5 cubic yards of ready-mix concrete that was delivered to us by Danny from Century Acquisitions. Special thanks to them and Champlain Masonry for helping us shore-up the foundation with their hard work and generosity. We finished the weekend with a solid foundation and we look forward to getting the build underway! Women Build 2018 officially begins this Saturday, May 5th! We are excited to host our first group, Women in Government, this coming Saturday. We will also be holding our media day event at the same time, so be sure to check out any and all coverage from this day on our Facebook page. We are excited to begin the whirlwind of Women Build where we will challenge women of all backgrounds to come together and devote at least one day to address affordable housing.